Starr Flagg is an agent with the Central Intelligence Bureau. In her first recorded adventure she states that she is with American Intelligence and does not specify the exact department but by the second adventure she gives the name of the group for whom she works. It could mean that this name was meant to indicate a different agency from the nascent CIA which got its official start in 1947, the same year as the adventure, or it could mean that she did work for the CIA but the name was in flux. Whatever the case, she is an agent and has been one for some time. This is shown by the fact that she is very much trusted by her bosses and capable enough to be sent out on missions alone, usually with never so much as a handler to assist. Flagg's missions are varied as are the locales. She is obviously at home in all manners of spots be they urban settings or in the various wildernesses. She is comfortable taking on bad guys in an evening dress and heels or in jeans and boots - it matters little as she is capable of hitting and kicking and taking names no matter the garb. As her cover for her travels all over the world, Starr Flagg maintains a second job as a star roving reporter for The Herald though which city that paper calls home is not mentioned. It is apparently famous enough that no one ever asks 'which Herald?' and good guys and bad alike open their doors when she knocks. Starr Flagg is a very attractive and athletic woman either in her late 20s or early 30s. She is single and totally unattached and not adverse to being in the company of equally good looking men. She is by no means dimwitted and though she will find herself in a tight spot on more than one occasion and a couple of times being very lucky to survive the trouble, she becomes imperiled through no false step of her own and she gets out of most because she can definitely handle herself. 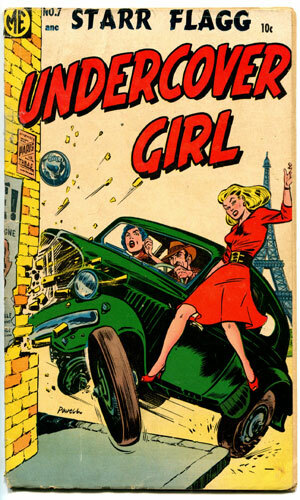 1 Star Flagg - Undercover Girl Complete! All of the graphic adventures and the single short story have been compiled into one large paperback format put out by Boardman Books edited by Matthew H. Gore. 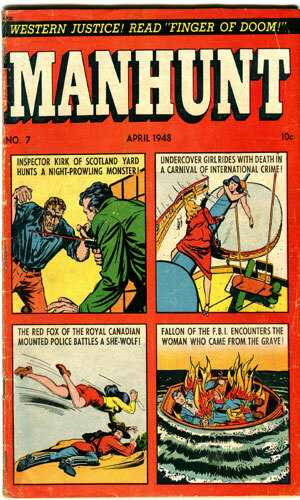 Though Starr Flagg is a comicbook character and thus would normally have her exploits depicted visually, the Manhunt Comics in which her adventures were shown also had each issue a short story by the author of most, if not all, of the stories being drawn. These two-page prose adventure were often divided with the opening page at the front of the magazine and the closing page at the end. Many of the dozen stories were about characters not regularly featured but each of the regulars such as Fallon of the F.B.I. and Kirk of Scotland Yard had one or two. Starr Flagg had just one. From Manhunt #2 - To learn more about the plans of a genius scientist, Starr Flagg goes into an interview in her guise as a reported but learns the good (and mad) doctor wants her dead. Luckily, Fallon of the F.B.I. is there to help her bring the nut case down. 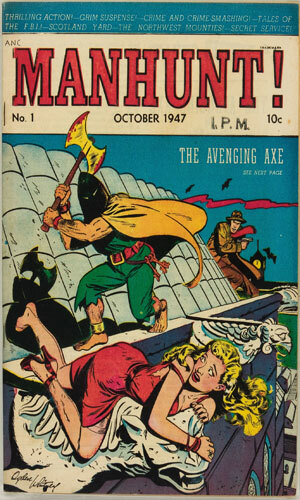 A true genius and innovator of the comicbook industry, Vincent Sullivan, started his own magazine company in 1943. Prior to that, he had been an artist and editor in the business for several years. It was he who bought from Jerry Siegel and Joe Shuster the character they were shopping, known to the world since 1938 as Superman. He was the artist who drew the cover of the first Detective Comics, the book in which a few issues later Batman would make his appearance. Sullivan was also, according to Wikipedia, the man who decided to buck the entrenched "standard" in the field and came out with a comic book series with just one character instead of an anthology of several different people in individual adventures. 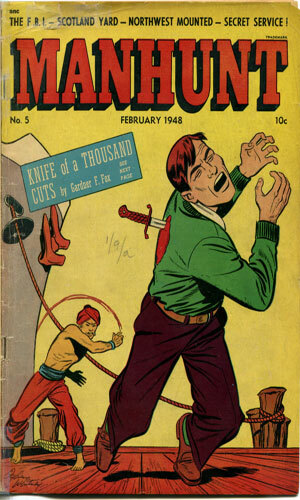 Sullivan was not totally against the idea of comics with multiple storylines in them, though. He just knew some mags needed more than one character and some could make it on his or her own. 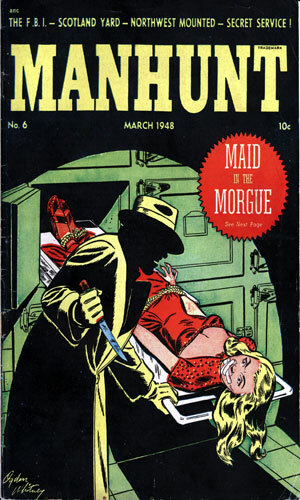 After he had left Superman/Batman headquarters (National Allied Publications, soon to be DC Comics, he worked for the McNaught Newspaper Syndicate as publisher for their new comic line. That lasted just a couple of years before he got restless and started his own line. The Magazine Enterprises (ME) he founded would last 15 years. Jet Black, Space Ace, who with his sidekick Jak Tal is a member in the future of the Space Patrol. Flagg, Fallon, and Kirk would be in each issue. The Red Fox would miss one or two. 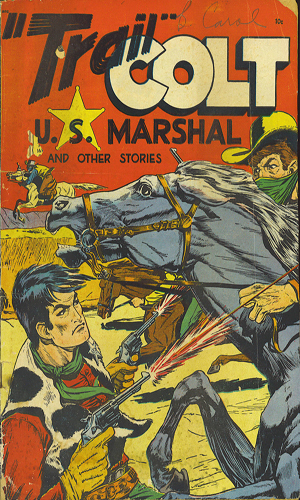 Space Ace would be dropped after 7 of the 13 issues and be replaced with Trail Colt, U.S. 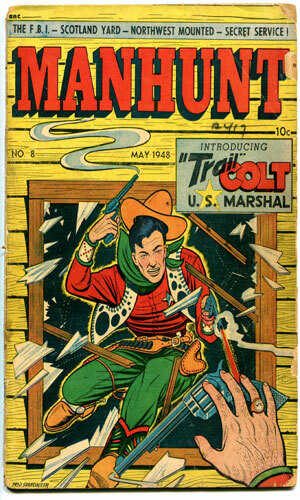 Marshal in the Wild West. Each of these stories were on equal standing with the others with no particular order being maintained and no one person monopolizing the covers. Each of the characters had his own artist maintained through the runs (as best as I can determined). 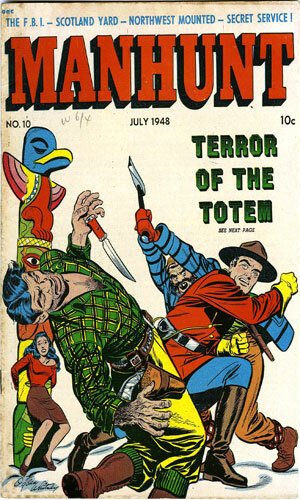 The writer for each is not known but the chance remains that the versatile and prolific author Gardner Fox was behind all of them. Certainly Fox wrote all the Starr Flagg stories as well as the short prose stories that each issue had. From Manhunt #1 - In France, Starr Flagg is told by a street painter of a strange woman who had her portrait done while her face was already painted oddly. Looking at a copy of the picture, Flagg recognizes it as plans for America's Alaska defense system and goes after the spy. From Manhunt #2 - Kruver is a leading scientist in the nascent field of atomic weaponry. Starr Flagg is sent to make sure he is safe while he takes a needed vacation. 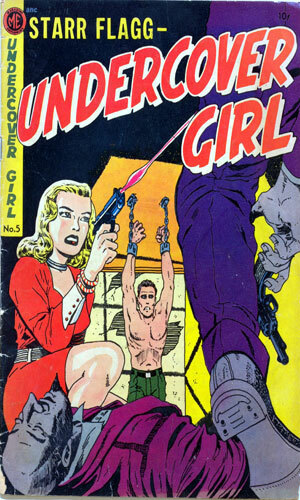 She quickly learns he has been kidnapped and replaced with an impostor. From Manhunt #3 - Starr Flagg seeks Ming Lee who has a ring that contains a formula that can set off a nuclear weapon from a hundred miles away. From Manhunt #4 - A statue contains the location of a stash of uranium that eastern bloc spies want to get and Starr Flagg wants them not to. From Manhunt #5. Alexis Pauloff has a formula for a mist that can dissolve steel. Starr Flagg is sent to find him but first she finds a gorilla who wants to kill her and then she finds Madam Darkova who wants to stop her. From Manhunt #6 - A dude known as Black Dan is finding ways to send secrets to enemy agents and Starr Flagg is sent in to find ways to stop him. 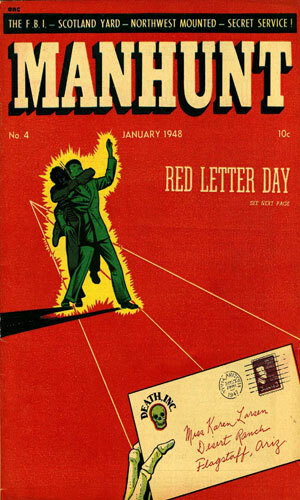 From Manhunt #7 - Before he could divulge a scoop concerning enemy agents in America, a radio reporter is murdered. Starr Flagg wants to catch his killers. From Manhunt #8 - Very bad men are preparing to explode nukes in New York and D.C. as well as other places. Starr Flagg comes across this plot while looking for a friend who disappeared investigating an old house. From Manhunt #9 - Siva Dey has come upon a means of bringing stone statues to life is planning on using them as her own private militia unless Starr Flagg can stop her. 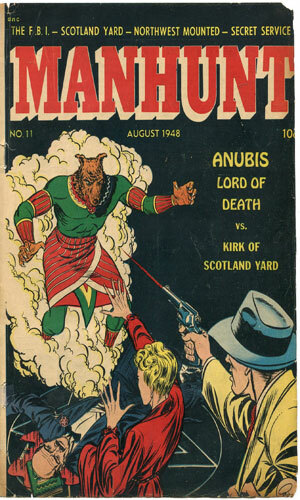 From Manhunt #10 - Sir Archibald Sexton is scheduled to meet with an Arabic delegate but others want him stopped. Starr Flagg is asked to help keep Sexton safe. 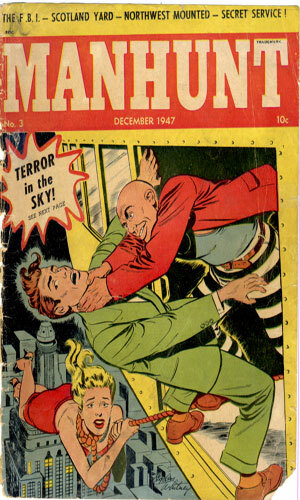 Reprinted in Manhunt #13. From Manhunt #11 - An agent has a pin that has a microdot filled with important info. She is en route Starr Flagg when she is stopped and the pin goes missing. 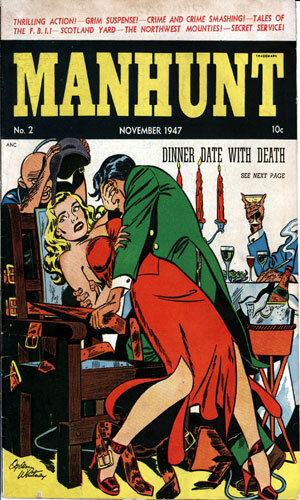 Reprinted in From Manhunt #14. 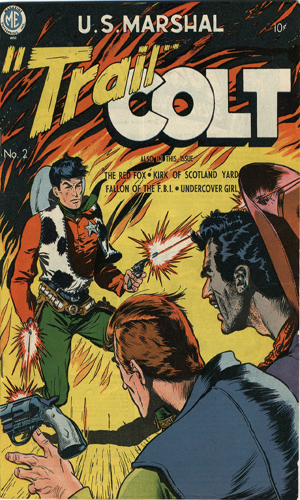 From Trail Colt #1 - Enemy agents want to get their hands on Major Amersley and Starr Flagg is determined that they fail. From Trail Colt #2 - A rebellion in a South American country is about to explode. Starr Flagg heads there to try to keep the peace. #12 "You Can Have This Fist"
and a reprint of a Fallon of the F.B.I. story. plus a reprint of a Fallon of the F.B.I. story as well as a story about a character named Roger Wright. A very capable and adventurous character is Starr Flagg. 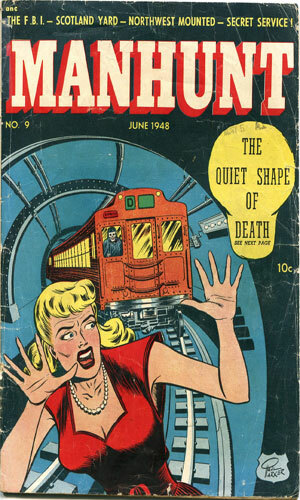 Having enjoyed her one dozen plus one missions, I would have liked more and definitely wished Gardner Fox has penned more short stories about her. We know so little about her but what we see is fun. 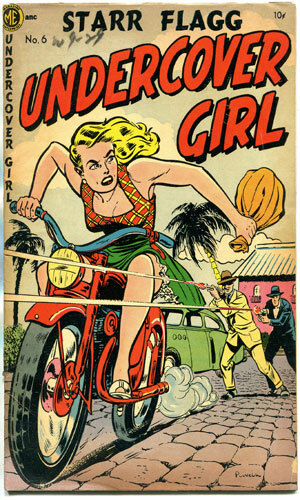 Around the same time that Flagg was operating, there were a few other female character leads in comic books who were not costumed super heroes, a couple quite interesting and self-sufficient. 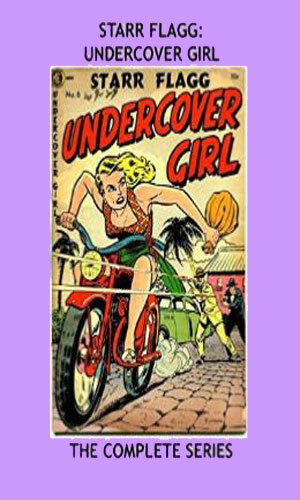 They were reporters or police detectives, though, leaving Ms. Flagg as the sole espionage agent. The writer and artist, Fox and Whitney, must have had fun with this series as they were not shackled to any particular locale or opponent. Enemy agents, mad scientists, crazed leaders, homicidal femme fatale, and a gorilla. A pretty good spread!